The local television landscape in the U.S. has undergone major changes in recent years, as a wave of consolidations and station purchases have made some broadcast media owners considerably larger. On Monday, Sinclair Broadcast Group, one of the biggest owners of local TV stations, announced that it has agreed to purchase Tribune Media’s 42 stations for $3.9 billion – a deal both Nexstar and 21st Century Fox were reportedly also pursuing. The merger would give Sinclair an even bigger presence in local TV, which continues to reach more U.S. adults than any other news platform. In a 2016 Pew Research Center survey, 46% of Americans said they often get news from local TV, compared with 31% for cable and 20% for print newspapers. 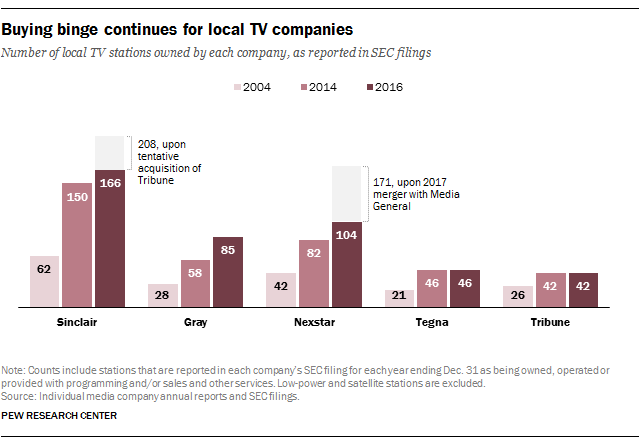 In 2004, the five largest companies in local TV – Sinclair, Nexstar, Gray, Tegna and Tribune – owned, operated or serviced 179 full-power stations, according to a Pew Research Center analysis of Securities and Exchange Commission filings data. That number grew to 378 in 2014 and to 443 in 2016. If approved by regulators, Sinclair’s acquisition of Tribune would bring its total to 208, by far the largest among the media companies. As of 2016, these five companies owned an estimated 37% of all full-power local TV stations in the country, as identified in a Pew Research Center analysis of BIA Kelsey data. Beyond increases in advertising revenue, the economic benefits of station consolidation also include increases in retransmission fees – the fees paid to station owners by cable and satellite systems to carry local channels – and an influx of political advertising since the Supreme Court’s 2010 Citizens United decision, which struck down major restrictions on corporate contributions to political campaigns. In 2016, the five biggest local TV companies’ total broadcasting revenue was $8.3 billion, or 30% higher than in 2014, the previous major election year. And political advertising revenue grew by 31% during this two-year period. (Retransmission fee numbers are not reported separately for all five companies, though data for the industry overall show that this type of revenue has also been increasing rapidly.) 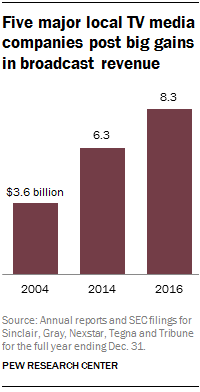 Since 2004, these companies have more than doubled their broadcasting revenues, while their political advertising revenue has tripled. Despite local TV’s current wide reach, a close examination of the survey data suggests a cautionary note is warranted. Younger viewers – those ages 18 to 29 – are less likely than older viewers to often get news from local TV (22% of them do), and these young adults are more likely than their elders to get news online. This age gap also exists for most of the traditional media platforms, including cable and network TV and print newspapers.